Bird photography is quite challenging in many aspects. I am about to start a series of short posts on the Wild Eye blog concerning bird photography basics and principles, so keep your eyes peeled for that if you are interested in our feathered friends at all. One of the key aspects of creating interesting photos of waterbirds is to try and get on "their level", i.e. shoot from as low an angle over the water as possible. 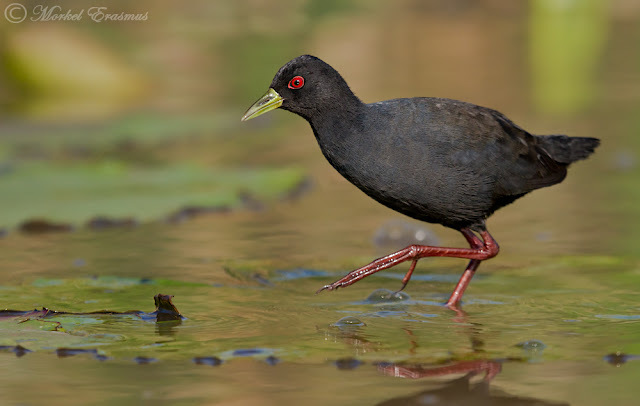 This photo of the normally elusive and secretive black crake was taken by lying down on the deck of a small boat and resting my lens over the side. The bird was strangely unperturbed by our presence, and as you should know, having a relaxed subject makes for great photography. What would you like to know about successful bird photography? Drop me a comment and perhaps I can address your question in an upcoming post!